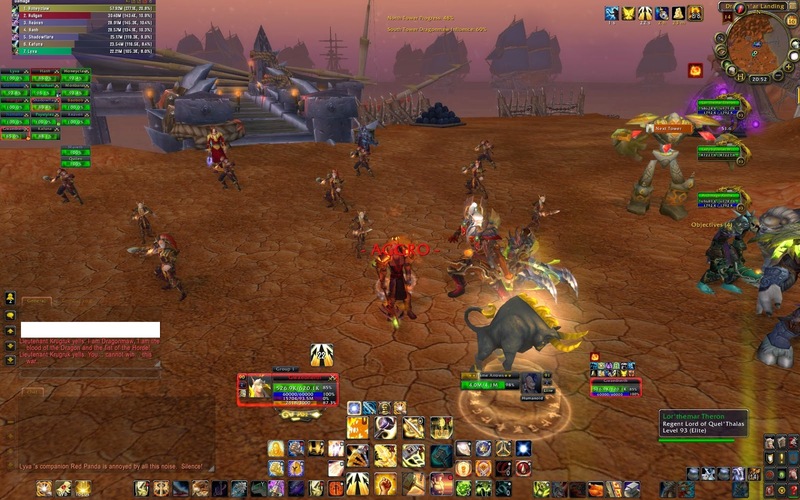 This dualweeks shared topic on Blog Azeroth is Interface and addons. Now I do have alot of addons, and they are all downloadable from Curse. But which addons do I use? 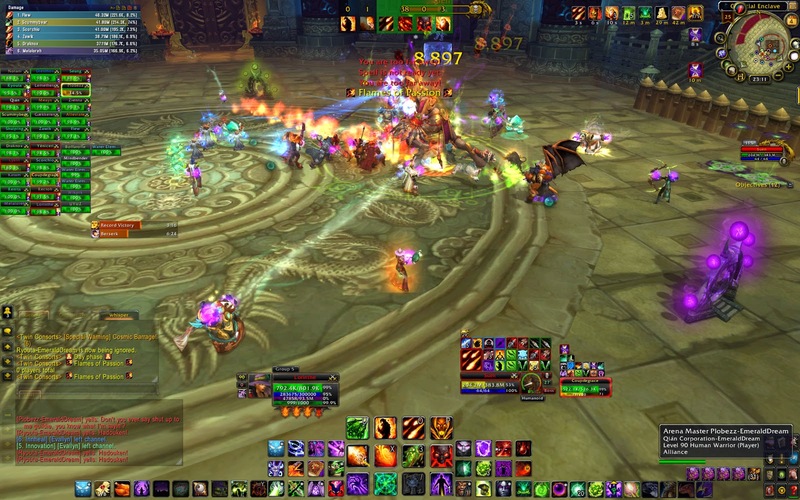 Well, first up, here's a screenshot of Lorinthe in an LFR. A lot of things look different here then in a normal UI, but one of the most profound things to notice is the bottom-centre. There are 12 buttons larger, comparing to the rest. 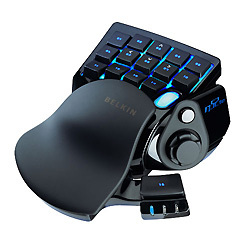 This is because I actually do not use the keyboard for raiding, but a Belkin N52TE gamepad. And because of the layout, and how my owns hands work, I use 11 hot keys, and the joystick on the side for movement. I know it has a lot more functions, but I normally don't seem to need them. Because I use this, all my alts have the same basic layout, using Bartender, I also made 2 12-blocks both side of the centreblock for cooldowns, buffs, and other frequently used spells, while the big strings that go to both corners are mostly for mounts/professions and other stuff. 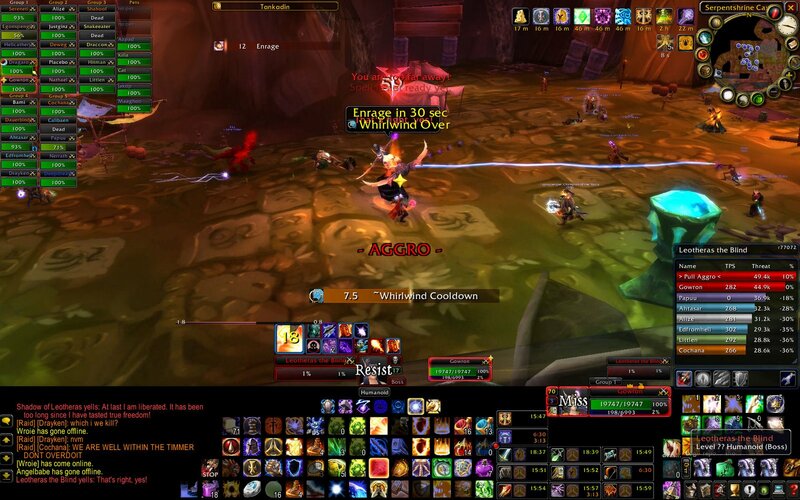 Now looking at a Mardah-screenshot, you immediately see the similarities, but because Mardah is my main raiding character, there are some things better positioned, and some more addons. Still the centre-block, with all the mainspells stays the same. List of addons I see during raids. Damage meter, but also more important a where-did-I-die-from-section. More shuffling around with bars then the original one. Mainly because I like it more that my own info is closer to the center, and under my feet. Various cooldowntimers that are important, so i don't have to find them in the mess near the map. Some are not shown at the moment, because they are Buff-Duration-timers. Replacement of the default, this one is set to the new eclipse state the moment I play a spell. Now if you look closely, all the important information for me is centered, and a little bit under my feet (depends on zoom-factor). This way I can both see my own health, which button to push, boss-cooldowns, and whatever is happening under my feet. I also like the fact that both left and right is rather free of stuff, so I can see what's coming from that side. Well.. it's very easy to loose stuff with all those alts I Have. Besides the handy what-does-the-boss-drop-list, it has many more lists. Most of the time turned off. I do sometimes go on a rare-hunt. Easier use of the Auction House, but I don't use all the options. Because I always forget which dust/ink is going to appear. The main-layout of my UI hasn't been changed much since I got the Belkin, and was tanking Malygos, way back when that was current content. That's about five years ago?? So this UI really works for me. 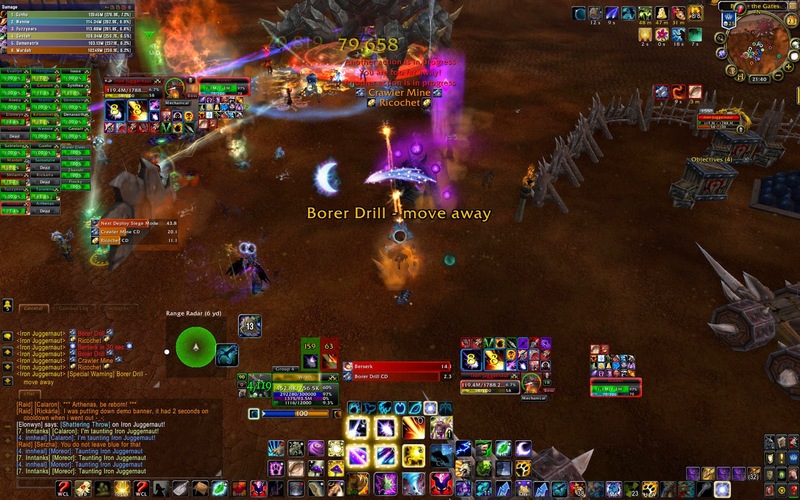 Some little changes will be made when Warlords of Draenor comes around, I'll probably loose the Dot-timer (Dot's will become fluid), and I may try the default raidframes. But as long as I have the belkin, the general layout will not change much.